First things first, if you read this on July 3, 2014 before 11:59PM ET, there’s still time to enter the Dream Cymbals and Libor Hadrava 10” Cymbal Stack Giveaway! Go get it! Detuning is a real problem for thousands of drummers – even among those who aren’t typical hard hitters. It’s the unfortunate result of an imperfectly designed mechanism (the drum lug) that is subject to backup under vibration. There are dozens of products on the market designed to combat detuning, but few are as simple, elegant and effective as the British-born Tuner Fish Lug Locks we’re checking out in today’s review. Before we get to the details, I really want to say that I love products like this – small, inexpensive gadgets or accessories that correct a problem with little to no fuss. I really appreciate the commitment to developing practical solutions for actual problems drummers face daily that don’t cost a fortune. Hats off, TF. Tuner Fish are essentially durable plastic caps that slip over the top of tension rods, then use an extended tail (they actually look like fish, which is a nice touch) on one side to prevent the rod from backing out by resting against the counterhoop, and stopping counterclockwise (de-tensioning) motion. It’s an exquisitely effective design that doesn’t require any head changing, rod removal, component replacement or permanent modification to any part of the drum. Just drop the Fish on, push the tails in place, and you’re good to go. Beautiful. I have a 14” floor tom that I like to keep at a very low tuning. Unfortunately, that means it’s prone to speedy back-out, and a good bit of rod rattle. That drives me nuts. Well, I should say it used to drive me nuts. Now it doesn’t because a couple of tuner fish popped on the offending rods solved the problem in like two seconds. Again, beautiful. In the video at the top of this review, you’ll notice that each Tuner Fish has two small grooves cut into each side for stabilizing rubber bands. Using the threaded portion of each rod as an anchor, the rubber bands (which are a little too reminiscent of the rubber bands I had on my braces – bad memories) drop right into the grooves and keep the Fish from bouncing off of the drum. This surprised me. I play in a band in which I hit very, very hard, and I used the Tuner Fish through several of those rehearsals on both my floor tom and snare drum. They didn’t budge. But, I guess there are a couple of homerun hitters who can rock these things off the rods, so this seems like a sensible add-on. Nice touch. Tuner Fish does offer a pack of appropriately sized rubber bands as a separate purchase. That may seem frivolous, but it’s actually really helpful as it’s not super easy to find the right band for such a small object. Tuner Fish are very small, so they won’t have too much of an effect on the appearance of your kit, but they’re available in a variety of colors nonetheless. Their US distributor was nice enough to send me a set of translucent blue Fish which looked perfectly fine against my walnut brown kit with chrome hoops. 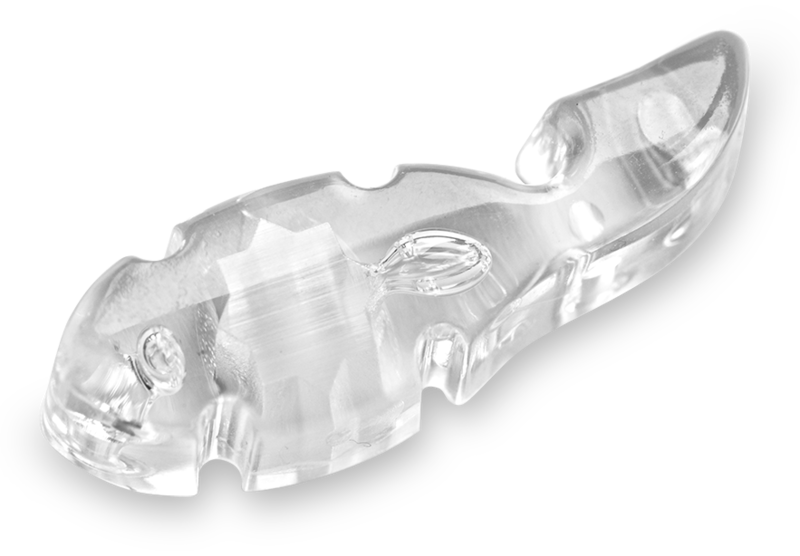 However, if you’re ultra-particular about aesthetic appeal, the company does offer clear Fish, which are pretty much Wonder Woman plane-invisible when installed. They also have several different pack sizes available, ranging from four to fifty. I want to be perfectly clear when I point out that the “issue” I mention below is barely an issue at all. It’s only a minor, minor, minor grievance I felt compelled to point out for the sake of creating a comprehensive review. Plus, the fix is extremely easy, and pretty obvious. Fair warning. My only issue with Tuner Fish is that the tension rod on which they are placed needs to be detuned just a bit for them to lock in on a triple flanged rim (this is less true for drums with diecast hoops, or hoops without an outward flange on top). What I mean is that when you place the Fish on top of a particular rod, the tail needs to be flush against the hoop for it to work. With a triple flanged hoop, the tail won’t lineup flush with the hoop wall because of the top flange. So, the fish drops on with just a little room between the tail and the hoop side, and is then turned so the tail locks in. Now, thankfully, the receiver on the inside of each Tuner Fish is an eight-pointed star, which allows you to line the tail up pretty close to the hoop wall. But, to get that tail flush, you do need to detune the rod a tiny bit. Truthfully, on snare drums with higher tunings, this wasn’t a problem at all. There’s already so much torque on the rods that a tiny tweek barely affects the drum’s tone. However, on drums with very low tunings, I actually found that tiny little nudge to make a difference in the sound. 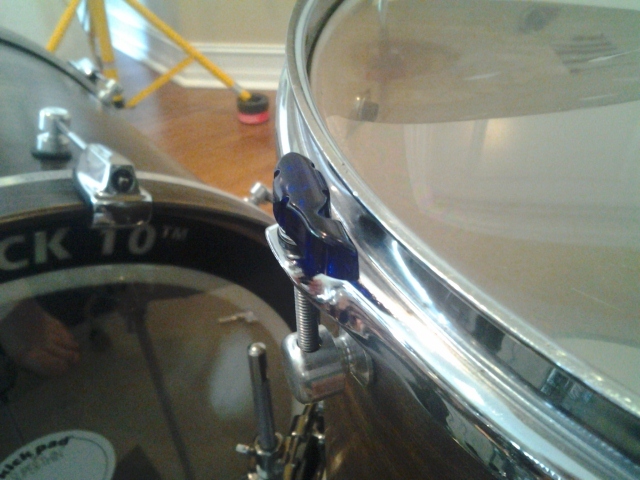 In fact, it happened when I used the Tuner Fish on the floor tom I mentioned earlier. That said, it was a very easy fix, requiring only a very slight over-tightening of the rod in question to compensate for the detuning. Beyond that, I had literally no problems with the Tuner Fish at all. I love Tuner Fish. That is all.